Did you know Goldfish actually prefer eating live plants? In nature, Goldfish seek out natural foods like water plants to appease their appetite. 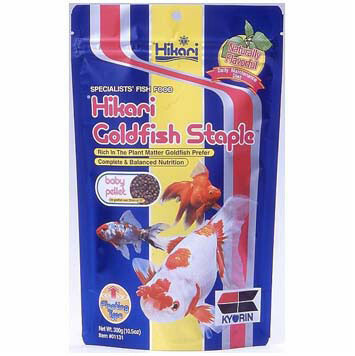 Hikari Goldfish Staple contains higher levels of plant matter including Alfalfa, Kale and Moroheiya offering an artificial colour and flavour free formulation. No artificial colours or flavours added. The natural green colour is derived from higher plant matter content which will not negatively impact your bowl or aquarium water. A complete & balanced formulation, no supplemental feeding is required. Contains all the necessary vitamins and nutrients your pet needs to live a long and healthy life. The Laboratory verified growth characteristics make this an ideal starter diet for most Goldfish varieties. Your best choice for Goldfish and baby Koi larger than 35mm. Our floating baby pellet is easy to feed and allows you to readily monitor your pet's intake to help avoid over-feeding and the related water quality and health issues that can result.